We offer customized Telecom Hybrid solutions with most of our patented design; made by the best OEM suppliers of Radio and Optical Fiber Modem and with advanced solutions interfaces and our furtive stealth antenna solution. 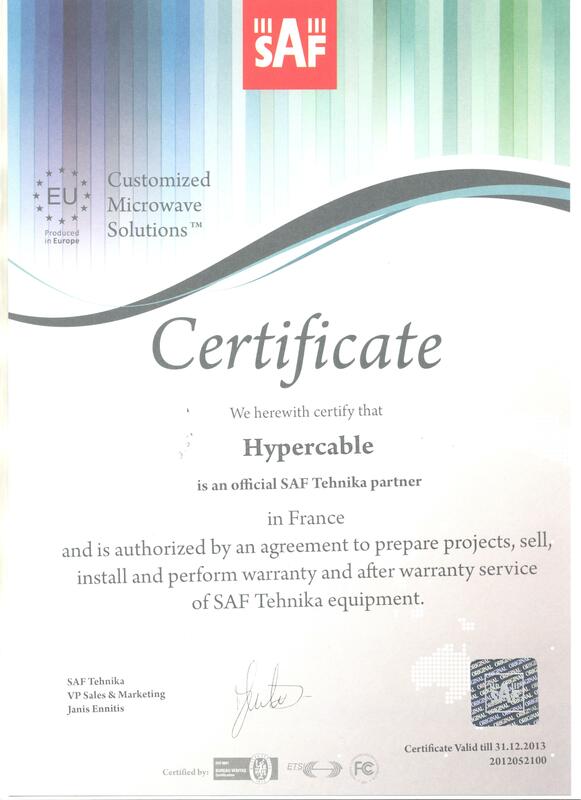 SAF Hypercable is among the world's top microwave carrier-class point-to-point radio manufacturers, ISO certified, covering spectrum 30MHz-80GHz with capacities up to 1.4 Gbps full-duplex. SAF Hypercable radios correspond to standards of ETSI. SAF Hypercable is committed toward providing strong focus on both the production and delivery of customer-adapted wireless solutions at a competitive price and highest standards of quality. SAF Hypercable recognizes its strengths in terms of the products we design, produce and repair, all of which are undertaken within the same HQ in Europe. This culminates in a perfect understanding of our entire equipment range and as the sole vendor delivering these products we have the flexibility to adapt solutions to meet the needs of our customers. Transmission immune aux interférences électromagnétiques, large bande passante pour les plus hauts débits, longues distances. En tant qu’un des leaders mondiaux des technologies de transmission sur Fibre Optique, MICROSENS conçoit des solutions répondant aux exigences de performance et fiabilité. Notre propre équipe d’ingénieurs saisit en temps réel les tendances du marché, notre outil de production se modernise constamment : 2 éléments fondamentaux garantissant des solutions haut-de-gamme optimisées aux exigences des utilisateurs. Les solutions originales de MICROSENS vous apportent une réelle plus-value de haut niveau. MICROSENS est le premier constructeur au monde à concevoir et produire son propre SFP certifié pour emploi dans les zones ATEX (ATmosphères EXplosives) conformément à la directive ATEX 94/9/CE. Avec les switchs MICROSENS Durcis et les SFP associés Hypercable transfère en toute sécurité les réseaux Optiques de point à point ainsi que vers les usagers mobiles ou fixes avec TROC et les radio WiRake et MobiRake associées . INNOVATION: Infinet's Hypercable's world class RF scientists, sourced from both the military and aerospace industries, have over 20 years of experience in creating industry-leading technological solutions combining the very best elements of WiMAX, WiFi, Mesh and proprietary technologies. RELIABILITY: Over 60,000 InfiNet Wireless devices have withstood the most challenging environmental conditions across five continents and are still in operation after 15 years of continuous use. It is not without substance, therefore, that InfiNet can claim that it makes the most robust systems in the marketplace. PERFORMANCE: High-capacity 300Mbps speeds and ranges of up to 200 kilometer with our Stealth MIMO Dual RHCP/LHCP antennas, enables IHypercable to create industry-leading wireless infrastructures for fully-fledged triple-play support in metropolitan and regional networks which require the highest Quality of Service (QoS) and performance combinations. FLEXIBILITY: Topology-agnostic, multiple-frequency, universal wireless platforms can be tailored to individual customer requirements to give them exactly the solution they need. INTEGRATION: Systems are easily integrated into virtually any network infrastructure, (including MPLS), due to the industry’s richest set of networking features and protocol sets.